At Priory CE Primary we are having a school wide focus on teaching the children to be successful and reflective learners. 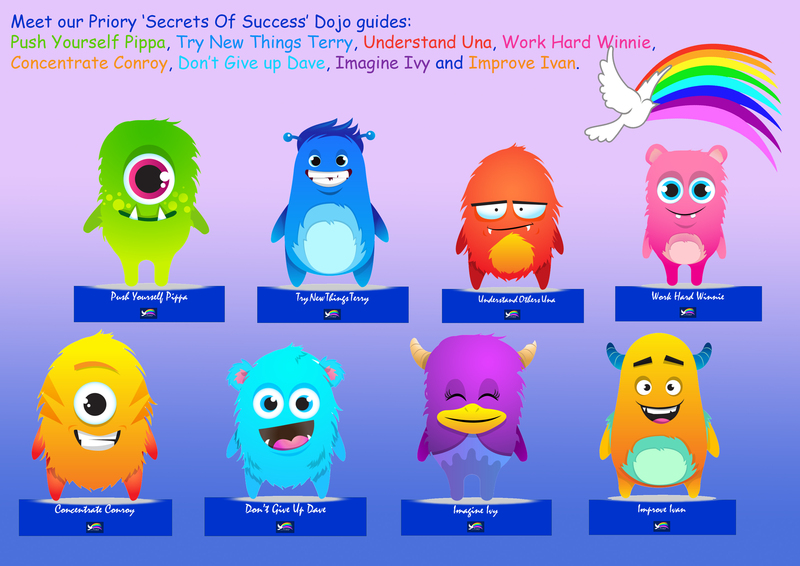 We teach the Secrets of Success by Chris Quigley to help our children in their behaviour, attitudes and values. Try new things If children are willing to try new things, they may just find something they are good at. Even better than this, they may find something that they love doing. Most successful people love what they do. Work hard We have designed a curriculum that is attractive and fun for our children. Alongside this we have planned activities that will make our children work hard. No real success comes without hard work. Concentrate Successful people learn to give their full attention to whatever they are doing. Allowing our children to focus on things that interest them, whilst at the same time learning all of the content that is required, this is a great way to secure engagement. Push yourself Successful people need to push themselves. Our curriculum pushes our children and teaches them about the need to push themselves. Of course, it is much easier to push yourself if you see the point to what you are doing. That is why our curriculum is engaging and relevant for our children. Imagine Successful people have ideas. They use their imagination and are prepared to be wrong. Our curriculum has lots of opportunities for our children to use their imagination. Improve Real accomplishment does not come from doing something once and moving on. It comes from lots of tweaks and refinements. Successful people are always trying to improve what they do. Our curriculum gives the children the opportunity to improve their work in many ways e.g. through Fix It time. Understand others No one has experienced success by thinking about themselves. Successful people understand others. Our curriculum helps the children to realise that collaboration is what the real world is about. Don’t give up Our curriculum has a certain degree of danger and risk so that the children are experiencing the real world. They have opportunities to fail in a safe environment and learn to have another go.